This impeccable Midway home just finished 6 months ago truly has it all, from the location to every thoughtful detail in the construction and placement. Intricately designed trim work on the vaulted ceilings, Carrara marble that surrounds you in the exquisite master bath, authentic natural wood beams, natural stone, and hand scraped hickory floors are made to shine with all of the natural light that flows through. Thermador professional appliances, a second kitchen on the lower level and wiring for home automation. The covered deck and patio, natural stone fire pit area, and extensive landscaping make the backyard the perfect place to dine, entertain and relax year-round. 1 Acre estate lot with superb mountain and valley views. The six-bay garage with room for an RV, means you'll never have to compromise when it comes to vehicle storage. 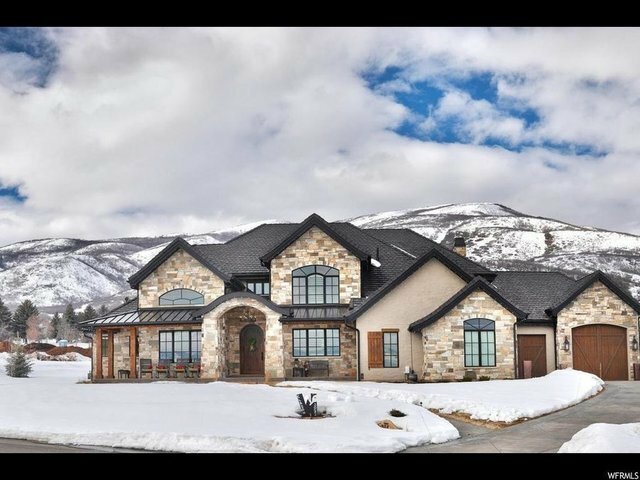 The Cascades at Soldier Hollow is an upscale mountain community with 72 homesites that offer captivating views of Mt Timpanogos, Deer Creek Reservoir and the Soldier Hollow Golf Course. If you are looking for an amazing home here in Midway that you do not have to spend two years building on your own, this is it.